Plumage: Black feathers covering abdomen and thighs. Grey feathers on wings, back and head. Long black crest feathers and elongated tail feathers. Range: Widespread south of the Sahara and across South Africa. High altitudes in Drakensberg to the semi-desert of Kalahari and not found in forests or true desert (coastal Namib). Habitat: Prefers short open grassland with scattered Acacia thorn trees for roosting and nesting. Avoids areas where grass is too dense or tall. Population in Wild: Declining. IUCN fact sheet states 6,700-67,000 mature individuals. Activity Cycle: Diurnal. Mated pairs hunt together during the day, rising late and returning to roost roost an hour or two before dark. Social Groups: Mated pairs occupy territory together. Chicks leave parents when mature. Diet: Diet consists of anything found on the ground: grasshoppers, lizards, rats, squirrels, shrews, small rodents and birds, eggs, chameleons, snakes and small tortoises. Predators: Humans. 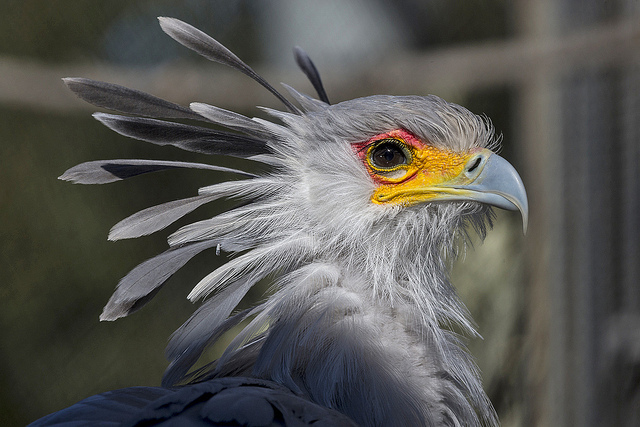 Other birds of prey may feed on Secretarybird eggs and chicks. Sexual Maturity: Unknown, but expected to be 3 - 4 years. Courtship: Courtship may last up to six months before egg-laying. Monogamous pairing. Clutch Size: 2 - 3 eggs. Nest: Made of sticks and weed stems, thickly lined with dry grass. Hatchlings: Cared for by both parents, eating liquid and whole prey from day of hatching. Fledging: Chicks usually fully developed, with duller plumage and yellow (rather than red or orange) facial skin. Feature Facts: The only species in this genus. Only bird of prey to hunt exclusively on the ground. Crown of crest feathers give the bird an unmistakable appearance. Kills prey by stamping to death, then swallowing whole. San Diego Zoo Global: Karani is a mature female who hatched in 2008. Aren, a young male, hatched in 2012. © 2008-2015 San Diego Zoo Global. Updated 2015.